FOR 2 TO 8 ADULTS WHO'VE GOT A THIRST FOR FUN! 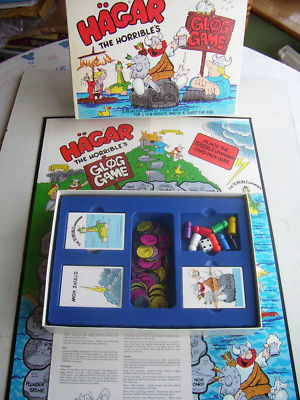 Hagar the Horrible's Glog Game introduces players to Hagar's lifestyle, a constant battle to keep Helga from confiscating his drink supplies. Hagar the Horrible is a hard working barbarian businessman - he's in sacking and looting. He has a typical Viking's hard life of drinking and working- plundering cities and drinking proceeds. His wife Helga has a 24 hour-a- day job trying to civilise Hagar! Stopping him spending all his time drinking or gambling with the boys.